274 pages | 9 B/W Illus. Positive psychology (PP) is a fast-developing area of research that emphasises personal growth and the positive qualities of life. This is the first book to apply the principles and practice of PP to sport and physical activity. character strengths, growth mindset and resilience. 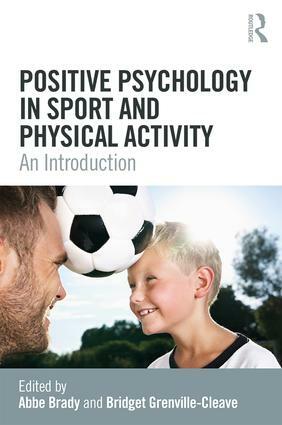 With expert contributors from around the globe, real-life case studies, practical strategies and suggestions for future research in every chapter, this book is inspirational reading for all students, coaches, researchers and practitioners with an interest in sport and exercise psychology, mental health and well-being. Part 1: Why a text on positive psychology in sport and physical activity? Abbe Brady is Programme Director for Sports Coaching at St Mary’s University, London, UK. Through her applied work as a registered Sport and Exercise Psychologist as well as her research, Abbe has developed an interest in well-being and positive psychology applications within sport and business. She has led symposia and workshops introducing positive psychology to students and practitioners in sport, and she presents on a range of PP-related themes at national and international conferences. Bridget Grenville-Cleave is a lecturer in Applied Positive Psychology at Anglia Ruskin University, Cambridge, UK. She runs well-being, resilience and engagement training programmes in business, health and education sectors and is passionate about community development using applied positive psychology. Bridget has written five psychology books, including Positive Psychology: A Toolkit for Happiness, Purpose and Well-being (2012). She is also an international speaker on positive psychology and a founding member of the International Positive Psychology Association.